We have all been there, the moment when you must go to the bathroom. If you are driving you simply pull over to the nearest gas station or restaurant. If you are in the mall or a strip mall, walk to the first place you see open. Finding a restroom sounds easy, but finding a “clean” one can become quit complicated. 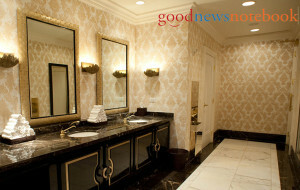 The Good News Notebook has complied a list of 5 locations, that we have experience and deem to be consistently clean. So what if can not find any of these locations around that we have suggested? We found 4 free apps that help you locate the cleanest restrooms in your area. Available for the iPhone and Blackberry, Sit or Squat lets you search for a public toilet by entering your address, zip code, intersection, or city. The results will guide you to a clean bathroom within minutes. If you don’t have a smart phone, no problem. Just text “sitorsquat”to 368266 to find a nearby restroom. Created by the website with the same name, Diaroogle is an app available for the iPhone that helps you find a free, clean restroom nearby by entering your zip code, neighborhood, or street address. For each entry you’ll find general cleanliness, the rules of entry, and sometimes even photos. Restrooms are rated on a scale of 1 to 5 and if you disagree with someone’s review, you can submit your own. Although the site doesn’t offer an app, you can easily take advantage of the mobile site on your smart phone. Simply enter your location and the app will pull up a list of nearby restrooms, its rating, and whether or not it’s free. On some entries you’ll also find details like if it has a diaper changing station and wheelchair access. As with Sit or Squat, you can also send a text message to (415) 350-2290 with your location and you’ll get details about the nearest restroom location. Whizzer lets you search by current location to find clean restrooms, those that are open late at night, and those with showers. You can also search to include baby changing stations, feminine hygiene products, and can even specify just how clean you want the restroom to be. Upgrade to the regular version of Whizzer for $0.99 and enjoy the app without ads.